When it comes to decorating your home, your goal is to invest in furniture selections that come with a high-quality design at affordable prices. If you are looking for mid century modern furniture, you are sure to find what you need at this website. Simply by browsing through the wide assortment of furniture choices, you will have your home adorned in no time. You will also be able to find exquisite furniture designs that can give you an exclusive layout to call your own. Once you are on the company’s home page, you will see a wide assortment of categories that you can choose from, which are located at the top and at the left hand side of the home page. These choices will take you where you need to go. Some of the choices that you can find under the modern furniture category can include accent chairs, love seats, office chairs, lounge chairs and coffee tables, just to mention a few of the alternatives. All of these choices are made with quality designs that will last you for many years. While you are shopping for your choices in modern furniture, you can also search through the mid-century furniture collections. 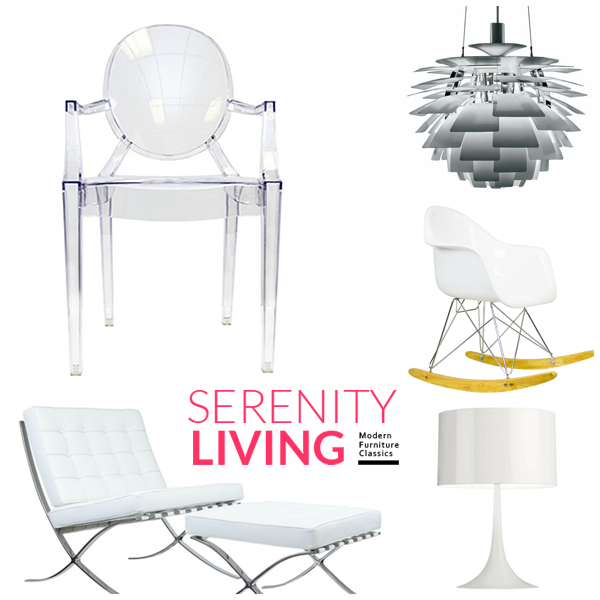 A few of the collections that you can find will include pavilion chairs, Bauhaus sofas, tulip chairs and Noguchi chairs. These choices have the mid-century designs that you have been searching for that can accentuate your home’s beauty. You will also be able to find modern lighting that can complement your furniture selections. Choices of modern lighting that you can find are chrome arch lamps, Arco style floor lights and many more. Once you find the selections that you want, you can proceed to the checkout area. This entire process is fast and easy. However, if you do have any questions or trouble with the website, you can contact customer service agents by phone. You are certain to have the results that you want with the unique furniture designs that you will find at this website. Fabulous!!! I have to tell you that that rocking chair is on my list of things to get some day SOON!!!! Thanks for sharing all of this goodness my friend! Hugs and love to you all! I would so dearly love to have a new couch of my choosing. Last time we got a couch it was a hand me down from our son’s divorcing friend. It’s not my style at all, it’s ugly, way too big for our small l/r and hate the upholstery. But it was free and it’s really comfy so I cover it with slipcovers, tablecloths, curtain panels, anything I can find that looks better than that clunker couch. SS doesn’t leave any “disposable” cash for us to buy a couch, not the way things have gone up. Wish we had the mid century furniture my parents bought when we moved to Tucson, AZ in 1950, it was quite stylish and very well constructed. My Dad always said people should invest in something that will last and should buy good lamps. Maybe that’s where I got my picky taste in furniture and lamps. I’ll take a good look in website for this furniture, give me something to wish for. Happy happy holidays.